Ha, ha, Jim. Ha ha. A step in the right direction, a very small tentative step. I fear it’s all for nothing as long as the emphasis is on testing for ability based on solely on grammar and vocabulary. I would prefer that the testing was abolished in English until after the young minds have entered HS thus giving them a fair crack at actually focusing on communicative English. Won’t happen I think and as long as teachers and schools are assessed on Exam results communication is always going to be poor second to rote memorisation. 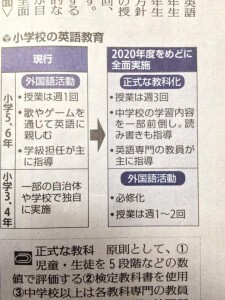 By 2020? With “specialist teachers”? Too late for me! And about frakking time but it should be done NOW! I agree with you, I’m cautiously optimistic.